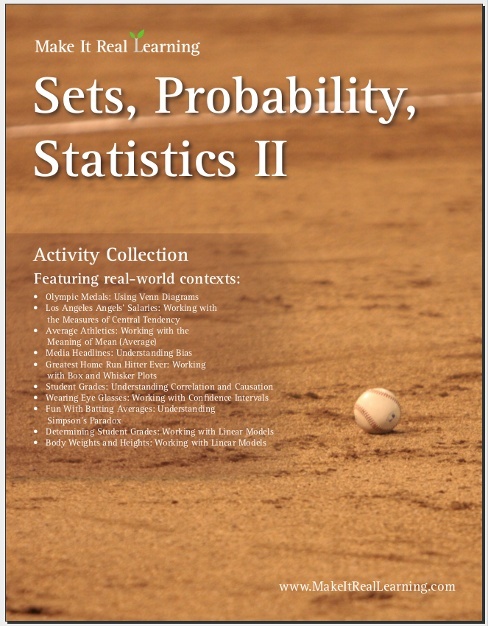 The Make It Real Learning Sets, Probability, Statistics II workbook focuses on real-world situations that may be effectively analyzed using statistical concepts such as average, regression, scatterplot, and correlation. 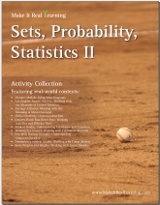 This book suits best grades 6-8 and high school. From analyzing Simpson's paradox with batting averages to using Venn diagrams with olympic medals, learners get to use basic statistics in meaningful ways. Each activity integrates real world information, companies, and issues (e.g. Major League Baseball players, olympic medals from 2008 Summer Olympics, salaries of Los Angeles Angels, headlines in media), not just "realistic" data. Working with the Meaning of Mean (Average) Analyzing the effect that a single outlier has on the mean. Is the information useful? Is some information missing? Could the data be used to twist the truth? Use and interpret the linear model in this context.